We are incredibly honored to receive the Apple Design Award for djay Pro on iPad and Mac, celebrating outstanding design and innovation particularly for making djay Pro fully accessible to the visually impaired. We founded Algoriddim 10 years ago with the vision to make DJing accessible to anyone. By now making our app fully accessible for the visually impaired, we have expanded our mission to open the world of DJing to blind users and take away their barriers to musical creativity. Watch the Apple Design Award ceremony. 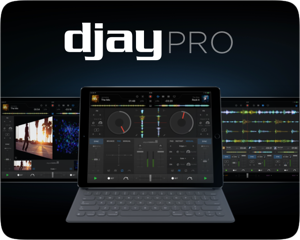 djay Pro for iPad is available on the App Store for $19.99. 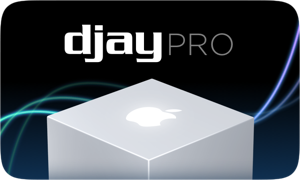 Today we are thrilled to announce djay Pro for iPad. Built exclusively for iPad, djay Pro provides a complete toolkit for performing DJs – Raw Power. 100% Pro. Pristine sound quality and a powerful set of features including high-definition waveforms, four decks, and video mixing give you endless creative flexibility to take your sets to new heights. Hardware Integration: seamless support for specific hardware controllers. 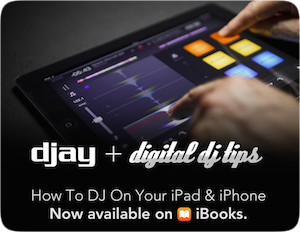 How To DJ On Your iPad & iPhone - Now available on iBooks. The book serves as a standalone and complete guide to DJing as a hobby or profession, aimed at both complete beginners and those new to digital DJing. 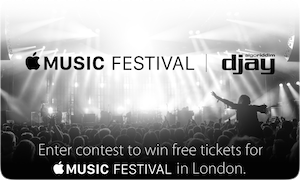 It covers all aspects of the craft, from standing out through your music choices, to how to get booked, even how to deal with pre-gig nerves – plus lots of ideas for furthering your DJing after you’ve successfully played your first public set. Get it from the iBook Store today. We’ve released a massive update to djay Pro, free to all existing users, with two important additions to the software. First up are a significant number of newly supported plug and play controllers. In addition to supporting the Pioneer DJ CDJ-2000nexus, CDJ-900nexus, and XDJ-1000 media players, djay Pro now has seamless plug and play integration with the Pioneer DJ DDJ-SB, DDJ-SR, DDJ-SX, DDJ-SX2, and DDJ-SZ controllers. Numark’s range is catered for too with the addition of the brand new new Mixtrack and Mixtrack Pro 3, as well as the established N4 controller. For the first time users of any of these controllers can mix millions of songs from Spotify’s extensive music catalogue using their existing equipment. Moreover, djay Pro now introduces advanced, first-of-its-kind trackpad gesture control fully leveraging Multi-Touch and Force Touch technologies built into Apple’s modern laptops. A range of two finger gestures work with the majority of on-screen controls such as mixer, tempo faders, filter, EQ, FX, offering the opportunity for greater accuracy, tactile feel, and artistic expression. In addition to the existing scratch gesture, it’s now possible to spin forward and back with a simple two finger circular motion, closely emulating forward and backward cueing on a turntable. The same gesture control can be applied to the overview waveform, which now becomes a strip search feature, as well as the FX pad which is seamlessly mapped onto the dimensions of the trackpad.